If you’ve been reading the RVshare blog for a while, chances are you’ve seen Washington, D.C. come up on our “must-visit” destination lists time and time again — and for good reason. Not only is it a rite of passage, as an American citizen, to get familiar with our nation’s capital… it’s also just an amazing place to have a fun, yet educational, vacation with tons of stuff to do for the whole family, thanks to its multiplicity of free museums and attractions. If you’re planning a trip to the National Mall, chances are you already know about the big stuff: The Lincoln Memorial, Vietnam Veterans Memorial, and Washington Monument are can’t-miss attractions for any Washington, D.C. visitor. But there are plenty of other National Mall sights and events to take in, some of which are often bypassed in favor of their uber-popular brethren. We don’t want you to miss out on these amazing, if slightly lesser-known, National Mall monuments, memorials, and more. Cherry trees provide a scenic canopy over this can’t-miss National Mall spot, which also features a breathtaking view of the Tidal Basin. 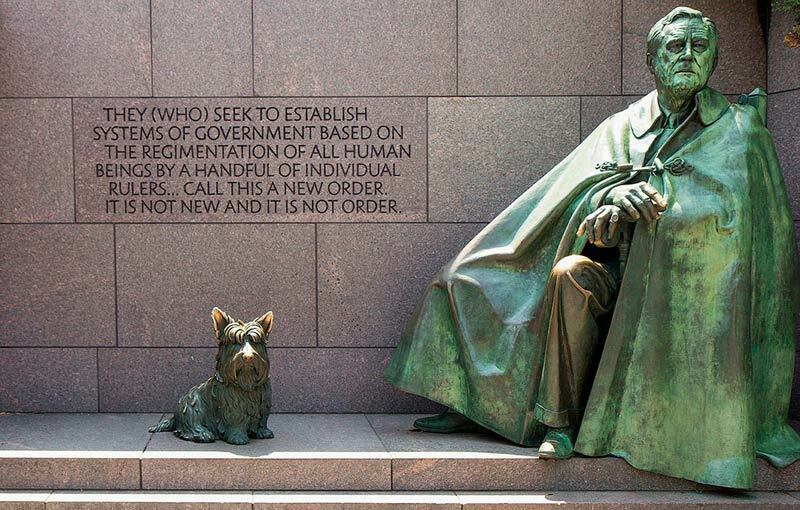 As its name suggests, the Franklin Delano Roosevelt Memorial is dedicated to the memory of FDR, our 32nd president, who was known for his fireside chats and Depression-fighting “New Deal” policies. The memorial was designed and landscaped by Lawrence Halprin, and due to both his personal devotion to FDR and the difficulty of the venture, it’s considered the capstone of his distinguished career as an architect. In keeping with FDR’s disability (he spent much of his life in a wheelchair due to polio), the memorial is specifically designed with accessibility in mind; tactile reliefs including Braille writing allow the blind to participate, and ramps are included for those who, like FDR himself, also travel on wheels. An interesting fact (and something to notice when you make the trip yourself): the statue of Franklin Delano Roosevelt himself was originally not intended to show him in his wheelchair, as the designers thought it could have been seen as a sign of weakness during his time. He was therefore carved seated with a cloak obscuring the chair, so that viewers couldn’t tell what kind of chair he was in — or wouldn’t even think about it. However, disability-rights activists later challenged this decision, protesting that his disability should be depicted as it really was. So today, you’ll see casters on the back of the statue, which were added later by the sculptor to make it at least symbolically accurate. While you’re ruminating on the life of an American hero over a view of the Tidal Basin, you may just find yourself wanting to get a little bit closer to that beautiful body of water — which, in fact, was once a swimming beach! Although you won’t find too many dippers there today, you can still get some aquatic exercise by renting one of the paddle boats available to visitors, which come in sizes to accommodate up to four people at once. There’s even a swan boat for you lovebirds! 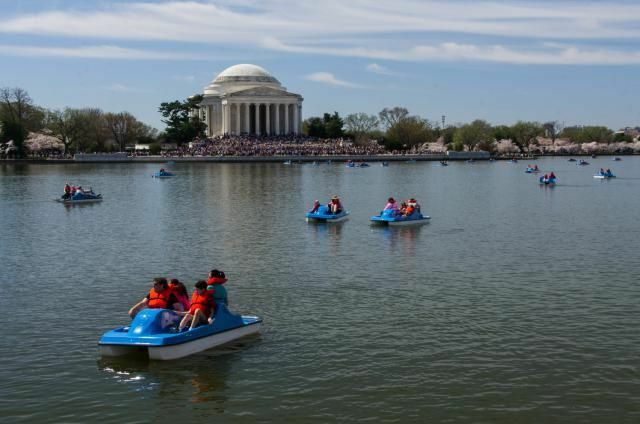 If you’re planning on a long walk through the National Mall later and want to conserve your calories, you can opt for a powerboat instead. Either way, you’ll get a whole different perspective on the many sights to see in our nation’s capital… but considering the popularity of these activities, you’ll definitely want to make sure you have a reservation ahead of time! 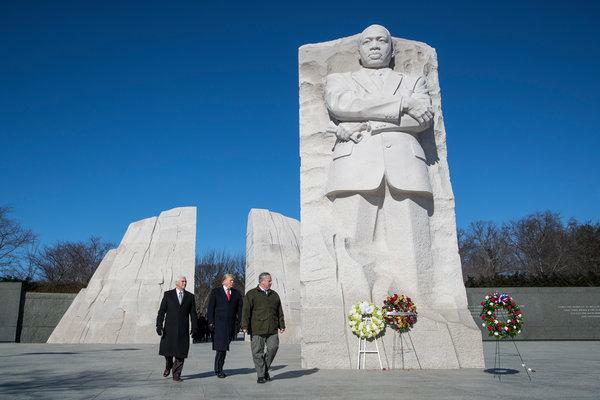 The Martin Luther King, Jr. Memorial is managed by the National Park Service, which means you can enjoy educational ranger programs and get your National Parks Passport stamped. You can also get your kids excited about history by helping them participate in the Junior Ranger Program; pick up a booklet with more information at the adjacent bookstore. Albert Einstein would have turned 100 in the year 1979 — and to commemorate that would-be birthday, this memorial was designated, and unveiled in April at the National Academy of Sciences’ annual meeting. 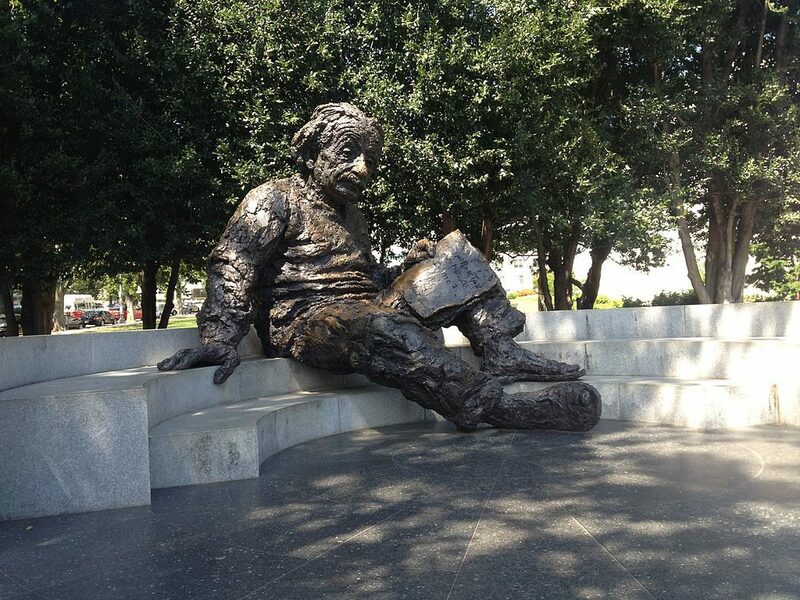 A seated statue of Einstein, the sculpture weighs in at approximately four tons and measures twelve feet in height — so it cuts a figure only slightly more impressive than that of the man himself. Although originally born in Germany, Einstein became a naturalized American citizen in 1940, and was elected a foreign associate of the National Academy of Sciences in 1922 after winning the Nobel Prize in physics. 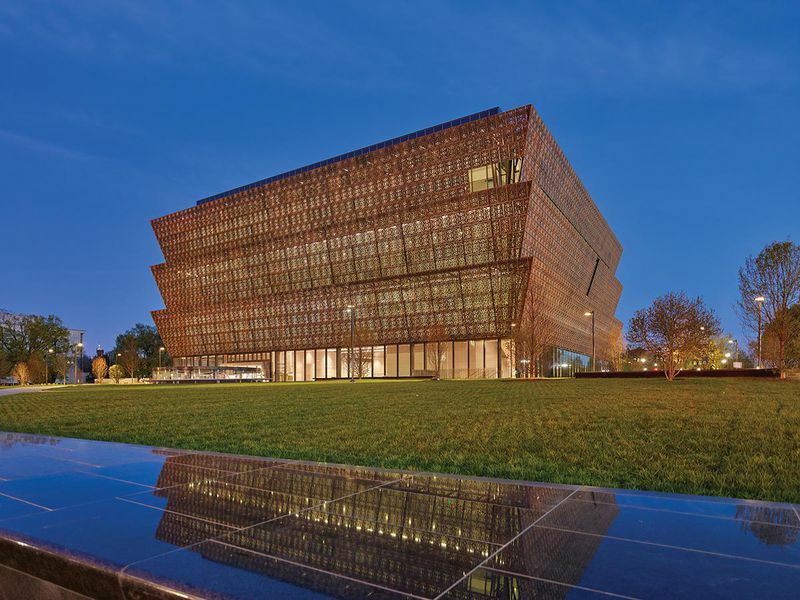 It provides an opportunity for those who are interested in African American culture to explore and revel in this history through interactive exhibitions. It helps all Americans see how their stories, their histories, and their cultures are shaped and informed by global influences. It explores what it means to be an American and share how American values like resiliency, optimism, and spirituality are reflected in African American history and culture. In other words, it’s definitely worth a visit, even if you don’t normally consider yourself a museum buff. (But since you’re making the trip to Washington, D.C., we’re going to go out on a limb and assume you do!) However, given the newness and popularity of this attraction, it’s important to plan ahead of time if you want to see it. The museum offers both Timed Entry Passes — i.e., reserved time slots — as well as same-day online and walk-up ticketing. The Timed Entry Passes for June of this year have already sold out, so we recommend you make your reservations for later-summer visits soon… or plan on waiting in line! Another member of the Smithsonian family, the Hirshhorn Museum and Sculpture Garden isn’t as new as the National Museum of African American History and Culture, but it’s just as worthy of your time and attention. Endowed in the 1960s with the permanent art collection of entrepreneur Joseph H. Hirshhorn, this museum focuses on modern and postmodern American art dating around and after the World War II period. Located halfway between the Washington Monument and the Capitol Building, it’s pretty hard to miss — especially given that the building itself is something of a work of art. Designed by renowned architect Gordon Bunshaft, the collection inhabits an open cylinder of a building elevated by four “legs,” all in the backdrop of a courtyard containing an iconic fountain. When the museum was inaugurated in 1974, Hirshhorn himself was in attendance, and said his collection was a “small repayment for what this nation has done for me and others like me who arrived here as immigrants.” As are all parts of the Smithsonian Institute, the Hirshhorn Museum and Sculpture Garden is totally free to enter. 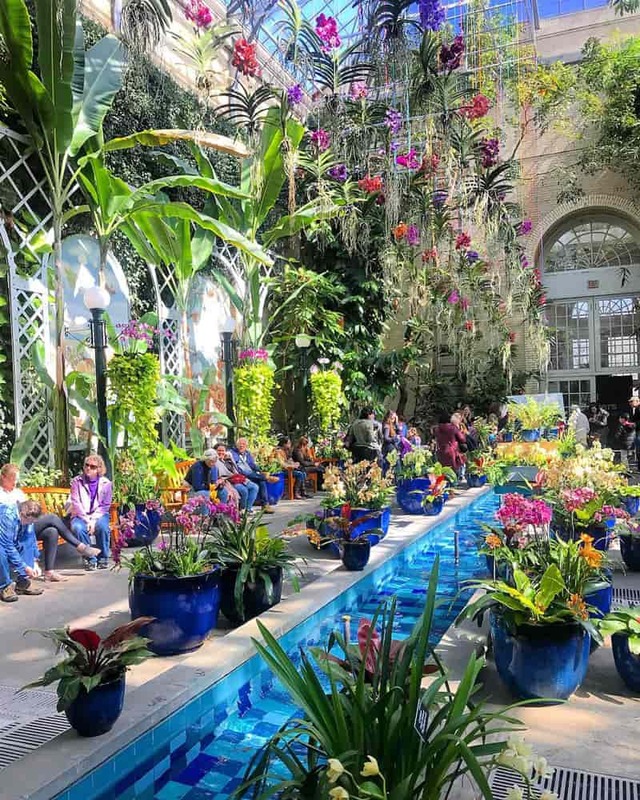 A visit to the Botanic Garden can help every member of the family realize exactly how important it is to be a good steward to our natural environment, and how lucky we are to live in a country with such a multiplicity of plant species. We rely on our relationship to the land for our food, clean air, and our very lives… and besides, who doesn’t love to walk through a beautiful, colorful garden? This sculpture, designed and created back in 1877 by Frank Simmons, is one of the most iconic National Mall sights to see. It was first designated to commemorate the deaths at sea of navy men fighting in the Civil War — but as any American citizen knows, its overall symbolic message is timeless. 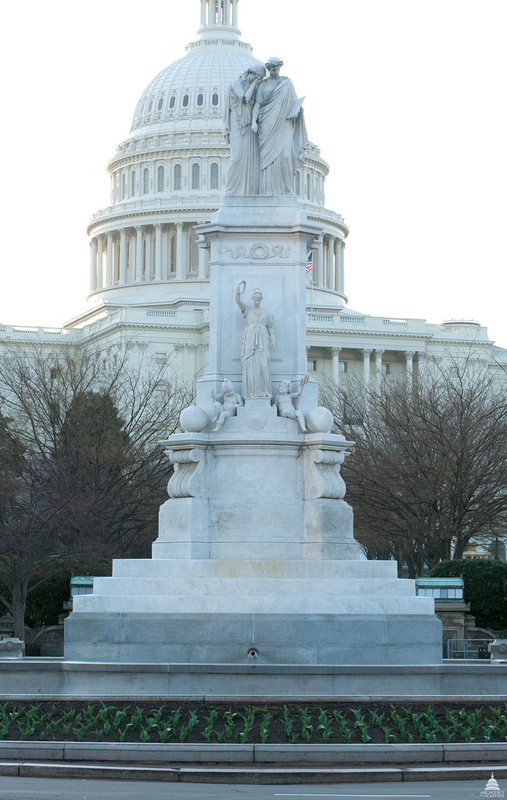 Measuring 44 feet in height, the monument is located just west of the Capitol Building at the corners of Pennsylvania Avenue and First Street, N.W. It depicts, at the top, the anthropomorphized figures of Grief and History, who weep and console each other while reflecting on our country’s history of human sacrifice. Below, another Grecian-style female figurine, representing Victory, lifts a laurel wreath on high, her other hand carrying an oak branch signifying strength. The infants Mars (god of war) and Neptune (god of the sea) are also in attendance, and finally, Peace herself, holding her olive sprig. We could continue to describe the unique way this statue commemorates those who bravely fought so that we might live free in our country, but to truly understand its moving power, you simply have to see it. And since it’s free, open to the public, and in a well-trafficked part of the Mall, it’s not hard to add to your itinerary. Our nation’s oldest federal institution, the Library of Congress isn’t technically on the National Mall… but it is just adjacent to it, nestled behind the Capitol building. Although it serves as the official research arm of Congress, it’s also open to the public, and you can take advantage of totally-free, guided walking tours. 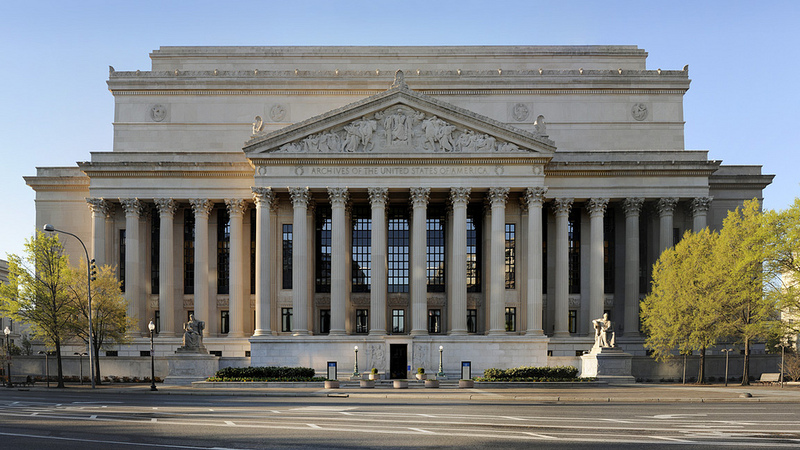 Along with discovering the historical and architectural significance of the building itself, visitors can also see rare, prized artifacts like an authentic Gutenberg Bible and the famous handwritten Mainz Bible, as well as Thomas Jefferson’s collection of more than 6,000 books. (And I thought I was a bibliophile!) He generously donated this impressive personal library after the War of 1812, when the first Library of Congress was burned by the British. Psst, here’s a cool insider fact: an underground tunnel leads directly from the Library to the U.S. Capitol Building, and is used by members of Congress for ease of access and to avoid inclement weather. 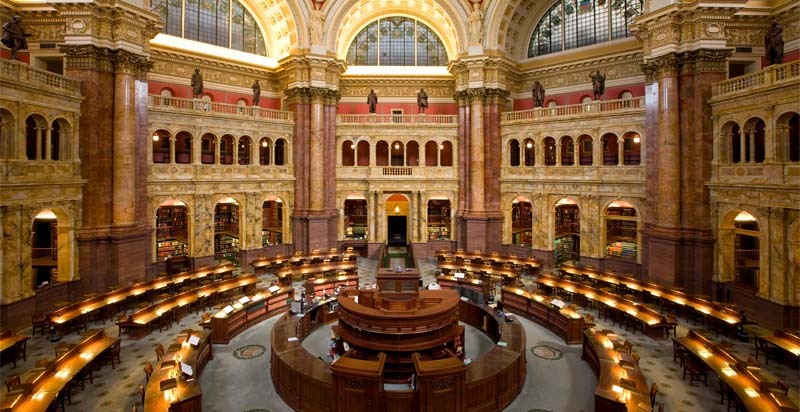 The Library of Congress is also the second-largest library in the world with over 164 million items, trailing only the British Library, with an estimated 200 million. Okay, okay, you caught us: this one’s not technically on the Mall, either. But it is an absolute must-visit for anyone staying in D.C., given that it’s home to such important documents as the Declaration of Independence, the Constitution, and the Bill of Rights. Serious history buffs can also nerd out on the Louisiana Purchase Treaty and the Emancipation Proclamation, as well as other important artifacts from our nation’s development. As are so many other things in this uniquely accessible town, entry is free and open to the public — and you can also take advantage of a wide range of events and exhibitions to learn even more about the way our country was built. 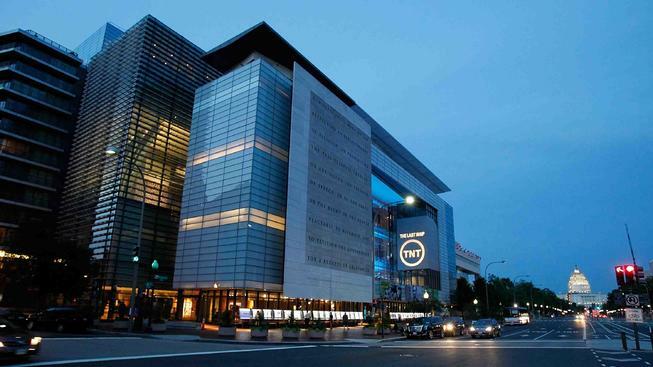 Clever naming aside, Newseum is no joke: it’s a high-tech, interactive experience that will make you change the way you think about our nation’s print and televised media. Open seven days a week with closures only for Thanksgiving and Christmas, this museum isn’t part of the Smithsonian family, and it isn’t free to visit… but it’s well worth the price of entry (which, at the time of this writing, is $24.95 plus tax for adults). Along with its slate of rotating exhibits highlighting the evolution of journalism both domestically and globally, visitors can also see informative films, participate in interactive educational ventures, and get even deeper with guided tours, walkthroughs, and VIP experiences. It’s located on Pennsylvania Avenue just behind the National Gallery of Art, though it is set to move to a new location in December of 2019 — so don’t miss it! Now that you have a whole slate of National Mall adventures lined up, let’s take care of some slightly-less-exciting logistics. 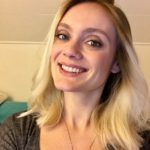 Where are you going to stay? 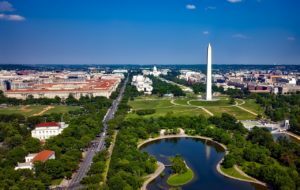 Although major urban areas like Washington, D.C. aren’t generally known for being super RV-friendly, there are actually a wide variety of campgrounds in the greater capital area, many of which offer all kinds of fun on-site amenities for those days when you just can’t take another big-city stroll. Here are a few of our favorite options to choose from. Located just 15 easily-drivable miles away from Washington, D.C., the Adventure Bound Resort in Lothian, Maryland offers a wide variety of resort-style amenities that’ll keep the family entertained without ever stepping foot off the campground: enjoy the on-site swimming pool, inflatable fun zone, volleyball nets, playgrounds, horseshoe ranges, shuffleboards, basketball courts, giant board games, store, nature trail and dog park — just to name a few options. 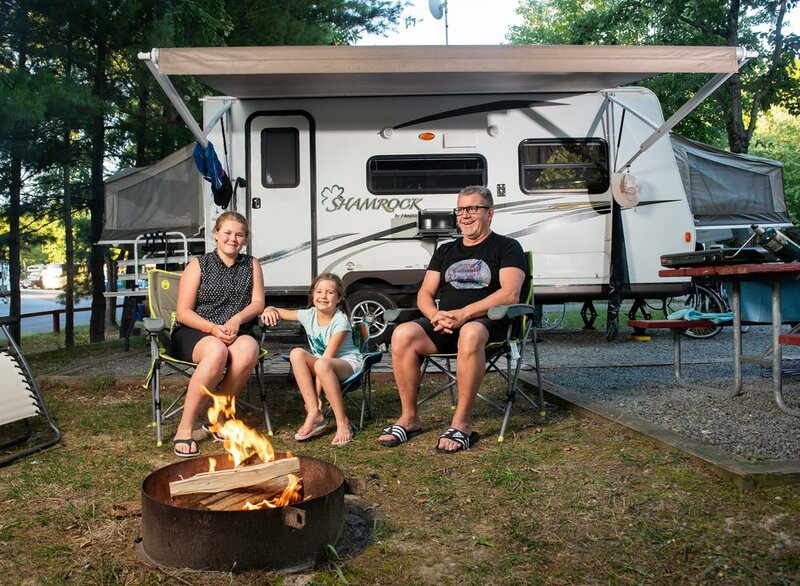 Adventure Bound also offers extended-stay cabins and other accommodation options, and you can learn more about these — as well as the most up-to-date information on rates for RV spots — by visiting their website or calling them at 443-607-8609. With the train station connecting to downtown Washington, D.C. only a mile away, this affordable RV park is an awesome option if you’ve got a current U.S. Department of Defense ID card. 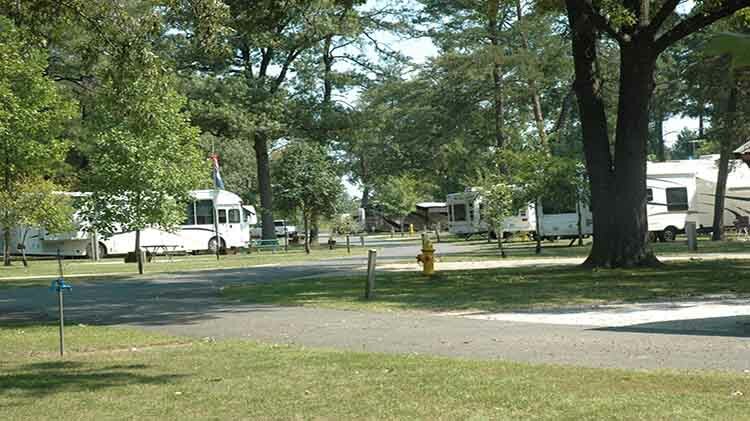 Rates at Camp Meade RV Park run between $40-$60 nightly and include 20/30/50-amp electric hookups, as well as access to a variety of on-site facilities including a convenience store, playground, boat rentals, and even a bowling center. The self-proclaimed closest campground to the heart of Washington, D.C., Cherry Hill Park offers all the amenities you could ask for and then some: full hook-ups for big rigs, free WiFi throughout the property, two solar-heated swimming pools, a hot tub, sauna, sightseeing sessions, an on-site cafe, and more. If you’re looking for a place where you can take a reprieve after those long days of urban adventuring, Cherry Hill’s got you covered: tractor rides and summer movie nights can transport you to the countryside, even when you’re within a stone’s throw of the capital. Rates for RV spots vary depending on whether you choose a back-in or pull-thru site, as well as whether you opt to upgrade from standard to premium. (Standard sites are already generously appointed, including 30/50 amp service, sewer, water, cable TV, an outdoor picnic table, and fire rings in the case of back-in slots — but premium sites up the ante with a brick patio, charcoal grill, and wrought-iron patio furniture.) Current rates start at $77 per night and go up to $98 per night, with a 10% discount available for active duty military and veterans, as well as Good Sam, AAA, AARP, FMCA, NAARVA, CAA, FQCC, and KOA members. Unfortunately, not weekly or monthly rates are available. Open from March 1 through November 24, the Capitol KOA is conveniently located in Millersville, Maryland, and offers daily shuttle service to the U.S. Capitol — so you don’t have to worry about battling big-city traffic. You have the option of staying with the group to enjoy a guided sightseeing tour, or go off on your own adventures before returning via the same shuttle later. 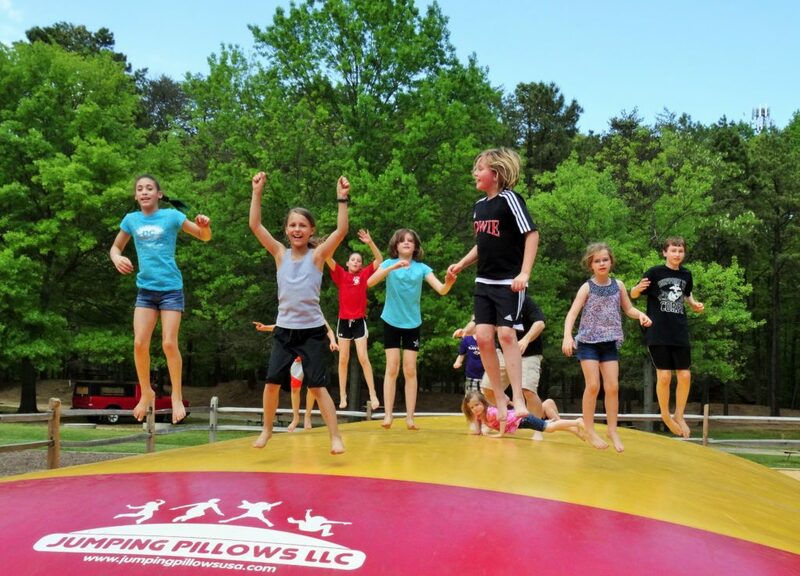 There’s plenty of fun to be had right on-site, too; amenities include an outdoor pool with lifeguard service, outdoor billiards, ping-pong tables, basketball courts, and a jumping pillow — which will ensure the kids get a great night’s sleep (and you will, too!) Free WiFi is available on the property, and propane and firewood are available for purchase; rigs up to 90 feet and drawing up to 50 amps of power are welcome. Contact the campground directly for the most up-to-date rate information. Think about it. Remember the last time you took a long vacation? If you traveled by car, you probably found yourself wishing away the hours on the road, sick of being cramped up in a small vehicle with all your luggage — to say nothing of the hassle of unpacking and repacking that luggage at every destination, staying in a string of overpriced hotel rooms. Or maybe you flew instead… which certainly gets you where you’re going quickly, but strips you of the full impact of taking in the sights along the way on your journey. And how about that crowded airport and the exhausting TSA rituals? No, thank you. In a travel trailer or motorhome, the journey really does become part of the experience in a whole new way. You’ll have all the space you need to stretch out and bring along your favorite gear without worrying about cramming it into a suitcase — or unpacking and repacking multiple times. You’ll get to sleep in the same bed every single night, and you’ll know for a fact that the sheets are freshly laundered. You’ll even have your own private kitchen on board, so you can save money by preparing meals at home! Of course, campsite accommodation fees are only one part of your overall travel budget. When you’re traveling by motorhome, there’s a significant fuel cost to consider… not to mention, if you don’t already own your own vehicle, the cost of the rental itself. Which is exactly why RVshare is such a great option for those looking to try out the camping experience without making the major decision of purchasing quite yet. On the peer-to-peer, by-owner rental market, rigs are frequently offered at a fraction of the price you’d pay at a big, commercial dealership… and they’re often a whole lot comfier and homier, to boot! When you rent from a nationwide dealership, you’re pretty much limited to choosing between large Class A and Class C rigs, most of which are going to be fresh from the factory floor. In good repair? Maybe… but totally lacking when it comes to the character department. 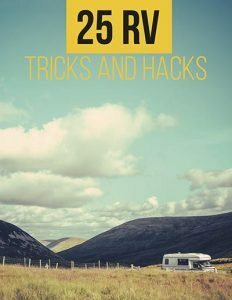 Renting from a private owner, on the other hand, gives you a multiplicity of RV types to choose from. You can find everything from pop-up campers to fifth-wheel trailers and even sleeper vans for rent. And since you’re renting from a regular person (who doesn’t have to foot the expensive overhead of keeping the lights on at a dealership floor), you get to benefit from their savings by paying less per night… and maybe even make a new adventure friend while you’re at it! To learn more about the RVshare rentals in your area an the unique suite of benefits we offer to the RVshare family, check out the listings near you today. Or, if you’re planning to fly into our nation’s capital and want a super-comfy home base for your explorations, look at the RVshare rigs available in Washington, D.C. by clicking here. Happy travels, and God bless America!